You know me and I love a good appliqué. SUPER EASY…AND THE BEST PART IS THIS PROJECT ALWAYS COSTS ME NEXT TO NOTHING. Mission: Create a v-day shirt for Mur-Man (spending nothing). And the best part was that I created TWO SHIRTS! First up, crash your clothes….I looked through the many used closed that Mur-Man is lucky to wear. Perfect…I found two long sleeve knit shirts! 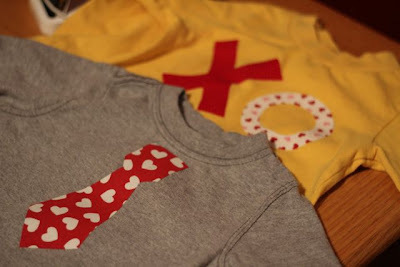 Pull out your fusible interfacing (AKA Wonder-Under) and create your design. 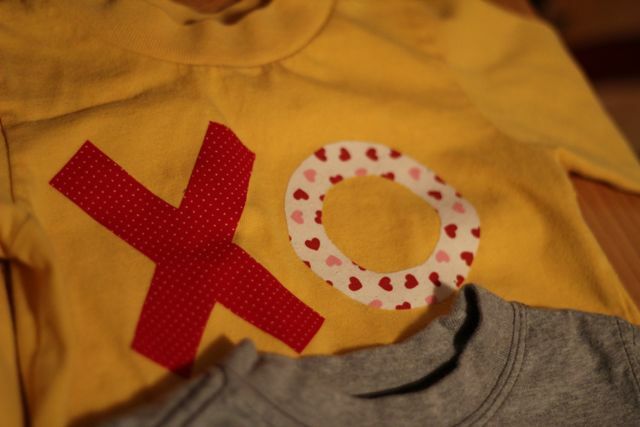 I opted to pull out my tie pattern (SUPER EASY) and created an XO for kisses for my Mur-Man. Trace the pattern on the fusible interfacing and cut. Once cut out iron (rough side down) to the wrong side of the fabric. 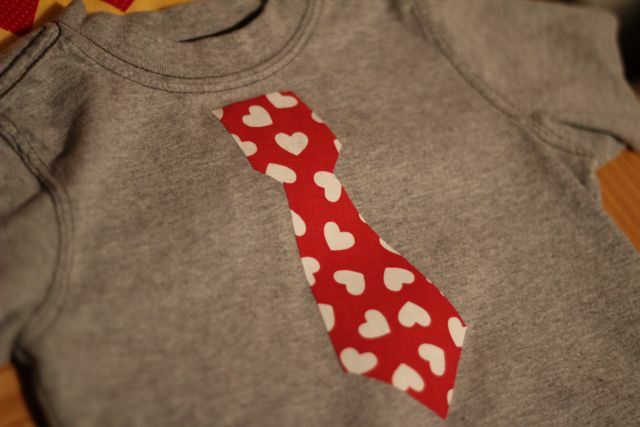 You will then peel the fusible interfacing layer away and iron the fabric to your shirt (in the desired location). The final step is to stitch around the edge. PERFECT…I HAVE QUALITY CLOTHES FOR MUR-MAN…ready to celebrate the season at no cost to me! LOVE IT!